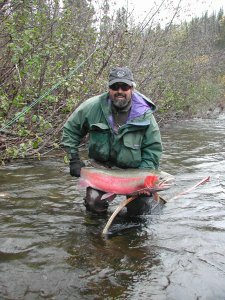 Fish conservation news has been pretty dismal of late with very low returns of salmon and steelhead throughout the west. Our northwest-based NGOs are out there advocating for wild fish, working to improve and protect habitat, building on available science, and strengthening alliances to leverage more influence in support of fish. Here are a few newsflashes hitting your Flyline editor’s inbox over the past month. Chris Santella and his band, Catch and Release, has released “The Last Steelhead – An Eco Rock Opera.” What a great idea! Titles like “Life Starts Here” and “4 H’s” and the folk/rock sound give voice and rhythm to the steelhead’s plight. With support of The Conservation Angler, Trout Unlimited, and Wild Steelhead Coalition, Chris and his band recorded 11 songs that are available free for streaming online. Along with the rock opera, Chris has written a booklet on “How you can help save wild steelhead.” The website includes lyrics and photos of the band in the studio and on the river. He hopes his band’s music can help spread information about challenges to wild steelhead beyond those who fish to a broader audience of music lovers. Check out Portland Tribune’s story about The Last Steelhead – An Eco Rock Opera. Deschutes River Alliance asks, “Where do we go from here?” Another year of poor anadromous fish returns on the Deschutes and at the Pelton Round Butte Complex did not prompt fisheries managers to do more than blame climate conditions and claim the reintroduction program needs “more time” to demonstrate its effectiveness in returning migrating fish to the upper Deschutes tributaries. DRA supports formation of an expert scientific panel outside of Portland General Electric and fisheries agencies to critically look at the reintroduction program in the upper Deschutes and assess options to improve the current program. Oregon Public Broadcasting aired a story on struggling spring Chinook and steelhead in California’s Salmon River on November 2nd. The Salmon River Restoration Council and the U.S. Forest Service have held a fish count every year for the past 24 years on 80 miles of this tributary of the Klamath. The numbers of the once robust spring Chinook have dwindled from thousands to just a few hundred fish. 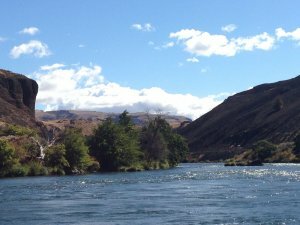 The Salmon River Restoration Council, local tribes, and fishing groups have petitioned the U.S. Government to list the Salmon River Spring Chinook as endangered but their request has been rebuffed because the government does not recognize the spring Chinook as separate from the fall Chinook population. The local groups hope there will be sufficient runs left to allow recovery once the Klamath dams come down. The Freshwater Trust published their latest edition of the Uplift report. In the report they quantify their work to restore riparian habitats, increase in-stream flow, and improve water quality. Details on restoration on the Rogue, Sandy, John Day, and Sacramento rivers are found in this report. The Wild Fish Conservancy sent an action alert for Puget Sound Orcas. The population of Puget Sound’s Southern Resident Killer Whales has plummeted to levels suggesting they will disappear completely. These whales are literally starving because their primary food, Chinook salmon, are also disappearing. Washington’s Orca Task Force has submitted recommendations to Governor Jay Inslee that they say are essential to save these whales: 1) Increased ‘spill’ at federal dams in the Columbia Basin and, 2) Development of a plan to remove the four lower Snake River dams. WFC supports these recommendations but were disappointed that the taskforce also recommended increasing Puget Sound Chinook salmon hatchery production. Moreover they did not address Chinook harvest closures that could immediately make more salmon available for whales. Wild Fish Conservancy asked its followers to weigh in by October 29th in support of the above recommendations and against increasing hatchery releases and in support of harvest closures. This press release tells you more about their concerns. Waterwatch is asking folks with knowledge and understanding of water issues on the Lower John Day River to review and comment on a draft report on the current state of its water resources. This report is the first of several reports that will address future water needs including in-stream needs for fish. Waterwatch also reminds us their upcoming Auction Fundraiser is November 17th! Western Rivers Conservancy has launched a new campaign in the Methow Valley in eastern Washington. The Methow River is home to wild Chinook, steelhead and bull trout. Western Rivers recently purchased a ranch at the headwaters of the Methow on the Chewuch River. By conveying the property to the Yakama Nation, they will protect these pristine waters from development. Wild Salmon Center has joined forces with the Babine River Foundation to study water quality in the river and work to protect the lower river from extensive logging and development. The partnership will bring international expertise and local knowledge and presence together to help preserve quality habitat on this legendary salmon and steelhead river. The cause is tremendous for wild fish and the photo on this link is breathtaking!